The private studio is set in a beautifully leafy,light and airy Victorian setting, where you can calmly concentrate on every precise movement you make, free from background noise or distraction. The equipment and mat studio comfortably accommodates private 1-2-1 sessions, duets, and small mat classes - maximum six people to ensure the highest quality and precision. The equipment including the original thick Pilates mats, rarely found in London studios, is made by Gratz in New York who built each piece according to the specification and design which Joe Pilates provided to them. Built for maximum comfort and optimum flow when doing the True Pilates workout. 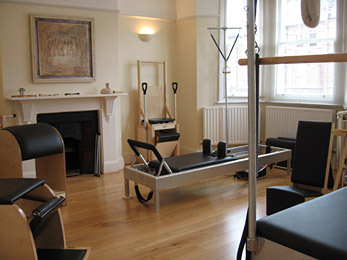 Some clients even call it the �Rolls Royce� of Pilates apparatus!